Alrighty folks, here it is…these chocolate power balls are one of the best snacks around! They are naturally energizing, taste fabulous and are jam packed with fiber, protein and all the good yumminess your body needs and naturally craves. My daughter just ate 5 of these babies. I had to cut her off from any more until I make a new batch tomorrow. Because I will be…they are just too good not to when I still have the ingredients on hand! Soak the dates in a small bowl of water for 10 minutes. Discard the water and remove the pits from the dates. Place all ingredients into a food processor. Process for 3 minutes, stopping to scrape sides of bowl if needed. 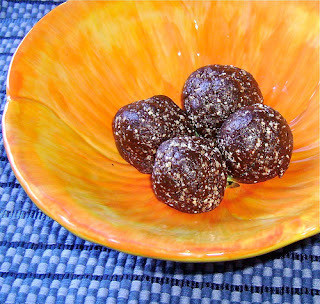 Turn off food processor and roll mix into small balls. Eat up friends! Want to switch it up? 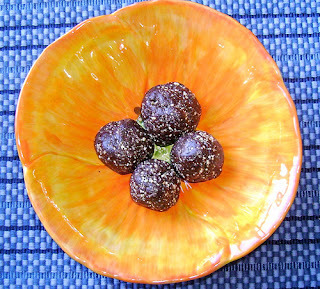 Additional ideas: substitute cacao powder for carob powder. Instead of wild orange oil, try cassia, cinnamon or peppermint oils or extracts. Learn how to get a Large Wild Orange essential oil for free as well as our amazing September team specials! What could I use in place of sunflower kernels! These look great!